The Apple Watch is a great little device that is very helpful when you are exercising, or as an aid for some of the simpler tasks for which you might not actually need your iPhone. But, like any digital device with a screen, you may occasionally find that the screen isn’t bright enough and you are having trouble reading or seeing certain things. 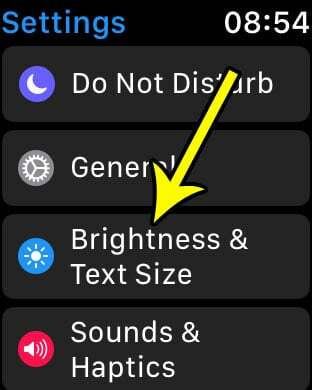 Fortunately the screen brightness on the Apple Watch is an adjustable setting, so you have the ability to make it brighter. 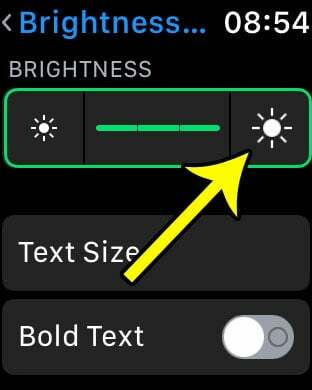 Our steps below will how you where to find this setting on your watch so that you can make the screen brighter and easier to read. The steps in this article were performed on an Apple Watch using the 3.2 version of WatchOS. Note that increasing the brightness will cause your battery life to decrease. Powering the screen is one of the more battery-intensive aspects of any digital device with a screen, and increasing the brightness requires the battery to work harder. If you find later that your watch is not lasting as long as you would like or are accustomed to, then you may need to follow these steps again later in the future and reduce the watch’s screen brightness. Step 1: Press the crown button on the side of the watch to show the app screen. Step 2: Select the Settings app. Step 3: Touch the Brightness & Text Size option. 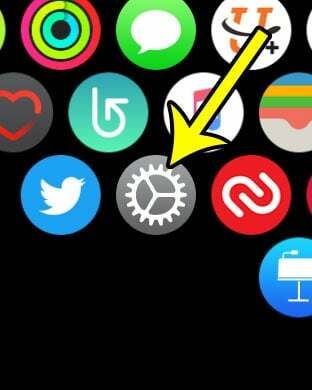 Step 4: Tap the larger sun icon to increase the Apple Watch screen brightness. The watch has three brightness levels. Once the meter between the two sun icons shows three separate green sections, then the watch is at its highest brightness level. You can then press the crown button on the side of the watch to exit this menu. Are you dismissing the Breathe reminders more than you are using them, or are you finding them to be unnecessary? Learn how to stop the Breathe reminders on your Apple Watch completely if it’s something that you aren’t using. How Can I Shut Down My iPhone from the Settings Menu?